I'm guest blogging over at iTeachthird today!! Head over and see what I have to say!! So one of my favourite parts of teaching is developing critical and creative thinking in my students. My all time favourite way to do that is by using thinker's keys. 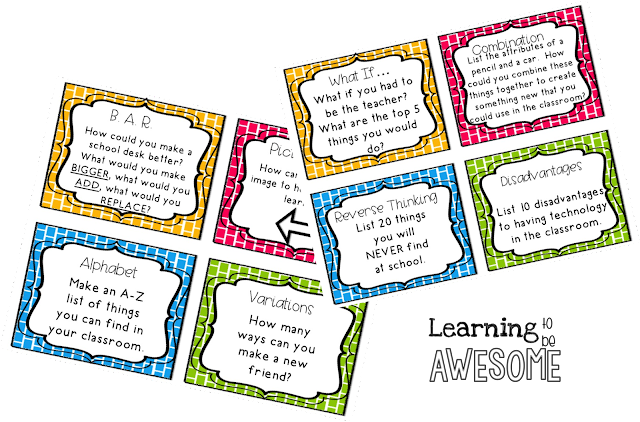 They are such an easy way to really delve into thinking processes, and see what kids are thinking about! 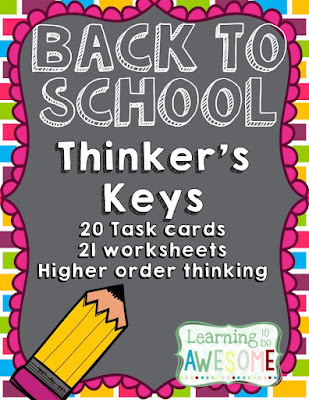 One of my favourite products in my TPT store is my Back to School themed thinker's keys. There are twenty different thinking tasks with varying degrees of difficulty. Half of the cards deal with thinking creatively, and the other half are critical thinking tasks. If you have upper grade students you could use these as journal writing prompts, using one a day over a few weeks. If you have lower grade kiddos then these prompts would make excellent oral language prompts. The beauty of these cards is that while they are back to school themed, they are actually generic enough to use all year round! Grab a bargain and get those brains working from the first day! OOOOOOkay, so I never got around to coming back to last week's blog hop post. So sorry about that people!! 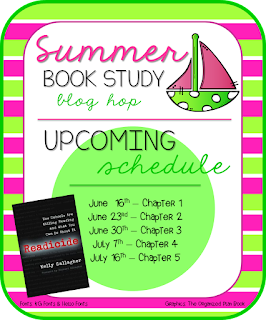 I'm here today though for the last of 5 posts about the Readicide book. It's been a great read - challenging, thought-provoking, and sometimes hard, but always good! So today I'm going to share things that I ALREADY do that line up with what Kelly Gallagher recognises are going to end readicide. I get my students to read after every break. It centres them and gets them ready for the next part of their learning. I stop "teaching" a book when I can see students getting frustrated. I also read in front of them - as in I read my novel when they are reading their own choice books some times. I let my students choose their own response questions. I use Bloom's taxonomy to promote thinking in my students. Do you do any of these above things? What could you do this upcoming year to make sure readicide doesn't creep into your classroom? Check out what Norah thinks! Sorry everyone! I'm a bit behind the times and not feeling very well! Hop on to the next blog, and come back to me soon! Can't wait to share my thoughts. It can't seriously be JULY already?! I just blinked and Christmas was over, and now we're in the second half of this year already. Oh My Goodness! We have 2 days left until winter break here in New Zealand, and I am SOOOOOO ready. My kids have been such troopers. It's been a looooooong 11 week term, and we are all so ready to stop. Today we watched Wall-E and I'm thinking I might have to watch another movie tomorrow with my kiddos, because we are just so bone tired it's not even funny! I'm heading over to the wonderful Farley's blog now to link up again with her currently post. I can't wait to read what every one else is up to! Listening - Does anyone else love this programme as much as me?! It reminds me of Desperate Housewives, only funnier. Loving - My sister has been studying at Oregon State for the past 5 years (Go Beavers!). I am SOOOO happy that she is finally back on home soil, and isn't planning on going any where any time soon. AND she's going to be living just an hour south of me!! Whoop whoop!! Thinking - A close family friend is having his 21st this weekend. I really want to get a new LBD, but I live so far away from any shopping centres now. HOPEfully there will be enough time on Saturday on my way home to stop in and have a look around. Wanting - Winter break starts this Friday. GOTTA make it til then. Two days... I can do this! Allstar - I'm awesome at playing the piano and other musical things. I got my performance certificate back in 2010. I'm looking at learning a new instrument. Not sure which one yet, but I'm leaning towards the saxophone. Head over to Farley's blog now, and see what everyone else is up to. I'm popping in only quickly this week to share my thoughts on chapter three in Readicide. Seriously people - go and get the book. You won't regret it. I'm busy busy this week - mid year reports, last week of school, family arriving from across the other side of the world, and just life in general. So I don't have heaps to say - just a few thoughts. This week really showed that there is a huge discrepancy between the haves and the have nots. Anyone who dares to say that there isn't huge racism issues in the western world is either delusional, or well, darn right living under a rock. It's rife, and there is no easy way to deal with it. Education should not be a place where this exists. We should be giving extra help, money, and resources to those in most need. The other thing I want to quickly touch on is how we absolutely thrash reading responses with our kids. Instead of inciting a love of classic novels with our kids, we spend every teaching moment pushing the pause button on stories with our students. Instead of encouraging them to become engrossed with the story, characters, and themes in a book, we over analyse every detail to the point that it's impossible to even follow the story any more. Seriously people - we need to do something about that. Let's start comparing the story to our real lives, but in a real way. Not in a way that stops our students from wanting to read anything ever again. I just want to end this brief blog post with a link to a post I remembered from years ago. It's from years ago when a then 16 year old wrote to famous novelists of the time asking them if they intentionally added symbolism to their works. The answers are interesting to say the least! Now hop on over to see the next post! 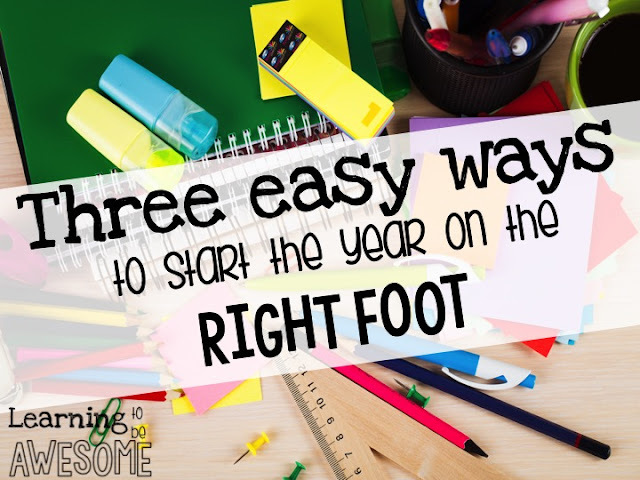 Three ways to start the year right! Get 'em thinking from day one!